Procreate is simply one of the best painting apps I’ve used on the iPad. I didn’t realize this fact until after a couple days of digging into the app. The UI is thoughtfully designed and stays out of your way. Having the the size and opacity on the left-hand nav-bar is great. It also allows you to touch the size slider and adjust the size of your paint stroke while you paint. The opacity slider works the same way. 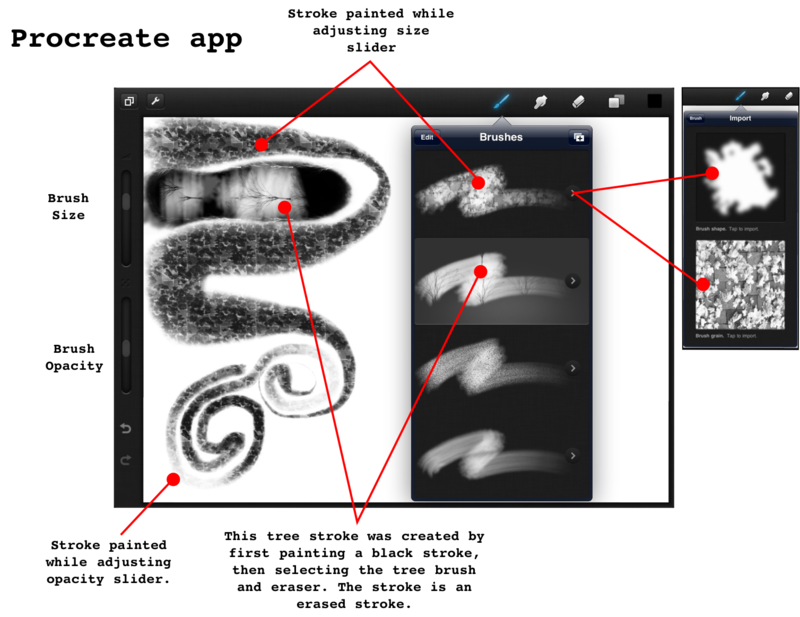 It’s never been easier to adjust the width or opacity of your paint stroke with Procreate. The painting and smudging tool experience is the best I’ve used on the iPad yet. It doesn’t feel like standard painting in other apps, it somehow feels better. It’s so smooth and responsive. Savage Interactive are the guys behind Procreate and they claim to have built a custom desktop powered painting engine. I’m not exactly sure how to explain how its’ different, but it is. (…) the Si painting engine written completely in OpenGL ES 2.0. That actually doesn’t just mean speed, but also platform independency. Did I mention Procreate has a brush editor? You can select a brush shape and grain from your photos to create pretty much any kind of brush you can think of. There are also a few other ways to tweak the brushes within the editor, such as a scatter and rotation for the shape component. The grain component allows for a movement, scale and zoom alterations. The canvas size is slightly smaller than the iPad’s screen resolution at 960x704px, but for posting to the web or making smaller prints this will be fine. I’m hoping for higher resolution in an update (and I’m told this is coming), either way it doesn’t hinder the painting experience. It does hinder exporting at high resolution, but hopefully this is only temporary. 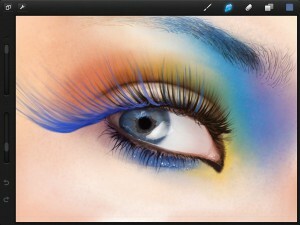 Procreate is a strong competitor when stacked against Brushes and Inspire Pro painting apps. Savage Interactive is responsive and actively planning updates to the app. This is important because the advancement of the other mentioned apps has all but stopped. 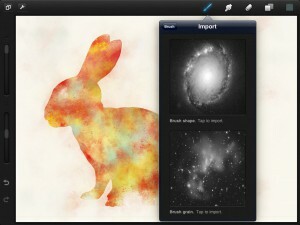 With some key updates Procreate will stand up and move ahead of it’s competitors as the best painting app on iPad. For me, Procreate has become my default painting app and I don’t see that changing anytime soon. Some may have gripes with the $9.99 price, but I don’t. I purchased at the sale price of $7.99 (still on sale) and after using the app would gladly pay full price. This may be the future of painting on the iPad. This isn’t a photoshop type tool, it’s a painting tool and at that it excels. Note: When I first purchased Procreate (at version 1.0 on March 16) and used it on the iPad 2 the app crashed almost constantly. For a few seconds I was frustrated, but I opened a ticket on the Savage Interactive website. Savage Interactive was great at diagnosing the problem. The company is located in Australia so the iPad 2 hasn’t even been released yet. Not only did they fix the problem within 2 days, they bought an iPad 2 from eBay and boarded a plane to pick it up flying over 600 miles to make it happen. This kind of service and response is unheard of and I commend them for such service. During the many crashes I had with Procreate v.1.0 I NEVER LOST ANY PAINTED WORK! I put that in caps because it’s important. I never lost my work. Version 1.01 of the app is currently in the app store as an update and has fixed the crashes. I haven’t had a single crash since I updated. This entry was posted on Thursday, March 24th, 2011 at 15:45and is filed under . You can follow any responses to this entry through the RSS 2.0 feed. You can leave a response, or trackback from your own site. It’s a decent app, but the reviews loses a bit of credibility for me since it fails to mention that the eye dropper crashes 100% of the time and the UI does not allow full screen painting, it can’t be hidden at all. Otherwise, it’s ok, not sure it’s worth the 7.99 price tag. @Johnny Walker – I had the eyedropper crash a couple of times, but for me it has been less than say 5% of the time I use it. For some reason, different users seem to have experienced more, I did not. Not all painting apps are great for everyone. It’s important to remember I’m basing my review from my experience. I’ve had a great experience with the app. Sometimes apps take a bit to get used to. If you bought it, you owe yourself at least 8 bucks of time to try and get to know it. Best of luck. It’s like Brushes in simplicity, with customizable brushes and a smudge tool. The UI isn’t bad. The only thing I miss is the replay of Brushes and the higher res export. But hopefully this will come in the future. No crashes for me either, but I never have this issue with Brushes. Really, these are the updates that Steve Sprang will hopefully bring to Brushes itself. I’m glad you’ve taken to the app Rick. It’s totally able to get a charcoal brush. And with regards to the HD canvas, it’s coming. And it’s not just a pixel doubling by the sounds of it. It’s sounding like a quadruple. Right now we’re working on the next update which will be a considerable update for Procreate users. Our major focus is on something we’ve referred to internally as ‘Quad-Damage’. I’ve been trying it too. I’m not overwhelmed by it. It’s not as fast as I was expecting based on the review but the brushes you can create are good. Still missing a few features for my liking. I think if you have the option of layers there really ought to be a multiply mode so you can paint under imported line work. as far as I know openGL is fully based on the graphic chip; that would mean procreate would really get a speed bumb by the 9 time faster chip in the iPad2. @Stefan the developers are responsive so I would suggest you head over to their support forum. Leave your feature requests and concerns there and the devs will respond promptly. Also, I’m mostly using Procreate on iPad 2 so it’s blazing fast. It would be nice to have some blending modes like multiply, but I’m not sure it’s that kind of app. I think of it like a cross between Inspire Pro, Brushes and ArtRage. Go leave your comments, they really listen! I enjoy sketching with Procreate and I’m REALLY glad the UI is always visible. I can get lost in the drawing easier it I don’t have to keep tapping to make tool adjustments visible. Thanks for pointing me in the direction of the support page – they’re very quick to respond – let’s see if the suggestions make it into the next version. I’m liking it more now that I’ve used it a bit – I too like the uncluttered interface. 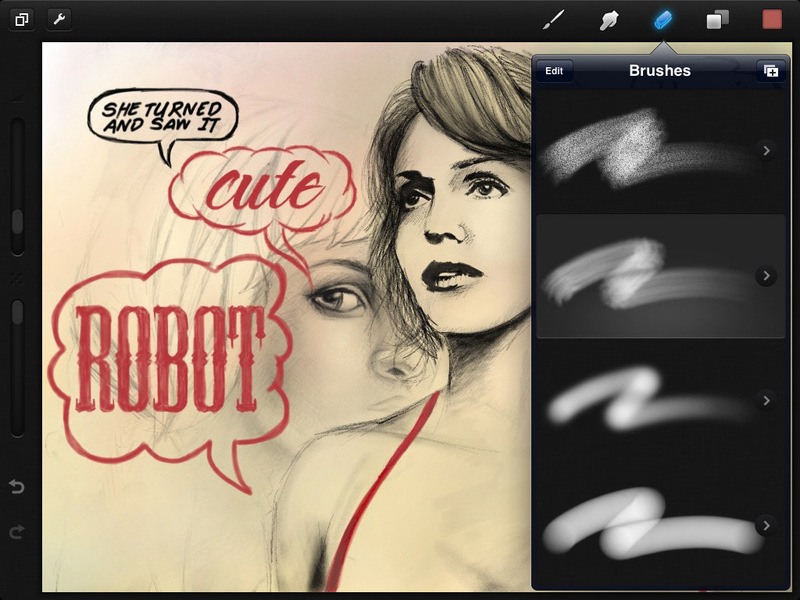 its certainly a very simple, straightforward interface and the brushes are very fluid. I would recommend it to beginning iPad artists, especially artists coming from no digital background. But it has too many things missing (maybe added later). I rely on Sketchbook Pros lock transparency, e.g. It’s new so that can change. And now the app is free! Go get it! Sale is over, but it looks like the app is $7.99 again. @Deborah – I’ve put lock transparency into the support forum because I think it’s a great idea. The team at Si have marked it for “Planned” so it will be in a future update. Fantastic review Chris. You understand the app from an artist’s perspective. I wish I had seen this before I wrote my review, you have such great details. And I knew about the iPad 2 endeavour too, they are truly dedicated. Thanks for sharing this great review, hope you continue to write! Great review. I love the simplicity of this app, though I’d really like to be able to flip the canvas horizontally and vertically (perhaps I missed this feature?) I really like having the tools available to me all the time yet they’re tucked away so that they don’t infringe on the canvas and agree the placement of tools down the left is very erganomic. Would I be able to import a digital photo, paint on that photo, save my image then export??? I want to buy this app but I’m curious about the photo import export function. Thanks. cheers, it was all coded and designed by our friend Luciana Lato.